Some newspapers still have a “separated at birth” feature, in which readers suggest someone looks like someone else and often the captions are swapped over to reinforce the joke. But originally Doppelgänger‘s meaning was quite different. It was one of those German words that came into English to serve for a concept we maybe didn’t have before. It literally means “double-goer” and refers to a person’s double or a wraith. There is a traditional belief that if you meet a physical or ghostly copy of yourself it is very bad luck or a warning of impending death. 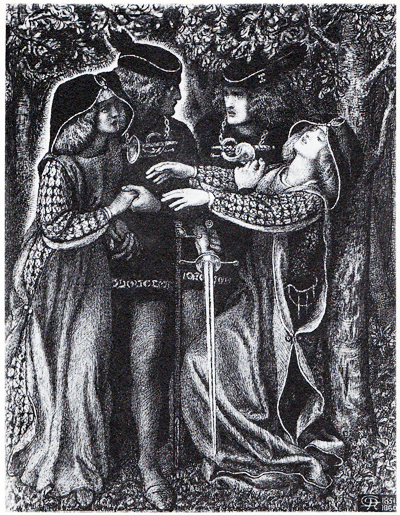 No wonder the young lovers in Dante Gabriel Rossetti’s “How They Met Themselves” look so appalled. It’s a concept in many cultures and Wikipedia has several examples of famous people’s encounters with Doppelgängers, notably the romantic poet Percy Bysshe Shelley – apparently his wife Mary Shelley (of Frankenstein fame) wrote after his death in July 1822 that he claimed to have met his own double. One of my favourite fantastic artists, Sulamith Wϋlfing (1901-1989), was German, so it’s not surprising her work often features strange, spiritual encounters. 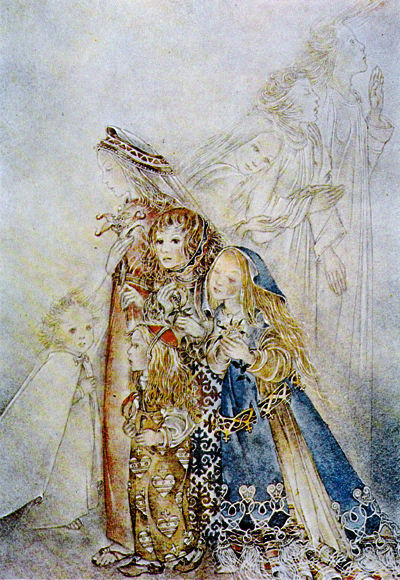 In her painting called “Meeting” there is surely a suggestion that the four little children are not long for this world, as their own ghosts drift by. I am reminded of the saying about “someone walking on your grave” – that feeling of an inexplicable chill on the back of the neck. Of course today most of us are familiar with the idea of meeting yourself, from the many science fiction books, TV series and movies on the themes of time travel or alternate universes. Usually when you go back in time you try to avoid encountering yourself as it may change the past and your earlier self may do something silly to prevent your future self existing after all, which is always a bit of a paradox. Sci-fi technologies such as teleportation can also often spawn copies of people, and it has become a bit of a cliché, probably going back to Doppelgänger‘s mythical roots, that the double is usually evil. Star Trek has done this many times through all its incarnations and often it’s the result of a teleporter accident or a slip into an alternate universe. From Star Trek: The Original Series I recall “The Enemy Within” , where Kirk fights with an evil double after a teleporter accident and “Mirror, Mirror”, where a transporter malfunction sends Kirk, McCoy, Scotty, and Uhura into a parallel universe where the Federation is replaced by an evil Empire. In Star Trek: The Next Generation Riker also meets himself as the result of a transporter phenomenon in the episode called “Second Chances”. Then in the Star Trek: Voyager episode “Faces” the doubling is done genetically when the Vidiians capture B’Elanna Torres and split her into two people, one fully Klingon and one fully human. Actually I guess these aren’t strictly doubles, more like halves. So that was Doppelgänger. Another similarly misused term is the Latin alter ego (meaning “other I”). It’s not your double or lookalike, but a role you play, or you in disguise, a different you. So for example Superman is Clark Kent’s alter ego, Batman is Bruce Wayne’s, Spiderman is Peter Parker’s – and Mr Hyde is Dr Jekyll’s alter ego. In Spiderman 3 the superhero externalises his inner duality - an alter ego with an alter ego? As for spitting image? According to my Chambers Twentieth Century Dictionary (1980), it comes from “spit and image”. “Spit” means to spawn. The slang term is often “the dead spit” or “the very spit” of someone. In full, the slang phrase is “as like him as if he had spit him out of his mouth”. Some years ago I was frequently greeted by total strangers. I put it down to my friendly face until someone told me there was someone who looked just like me living in the nighbouring town – even had kids the same age. On reading this post, I’m relieved I never met her. My alter ego is a terrifyingly efficient and accurate editor. Actually, its not an alter ego, it’s a myth. The real and only me is disorganized and careless. Thanks for the comment. Where’ve you been these last few weeks/months? I missed you. Apologies for silence – rather a lot happened in a short time and not all good, but we’re back in fighting form now. Regarding past/future paradoxes, Fritz Leiber, in his short story “Try and change the past” puts forward the idea that the universe has invested so much time and energy getting to and maintaining the present, that it will go to extreme lengths to protect it from change. In the tale, a cheating husband is shot in the head by his infuriated wife, who then blows her own brains out. Through some means I can’t recall, he gets the chance to go back a very short distance in time, to try to change his own future. Nothing works, and he repeatedly – and creatively – gets shot in the head. Eventually he hits on the idea of going back and killing his wife, which he does then, standing at the window feeling smug, he gets brained by a meteorite! Nice one! The opposite of Groundhog Day, I guess. There are such a lot of possibilities in time travel stories. I always liked the idea of “universe sheafs and open-ended postulate systems”, which I think I read in Heinlein somewhere, where there are an infinite number of universes side by side, each different from the next because of one tiny thing. I haven’t read enough Leiber, although I always look out for old paperbacks from the golden age when I am in Addyman Books in Hay on Wye, which has a good selection of SF. I have read Gather, Darkness!, The Wanderer (which I liked) and The Silver Eggheads (which I didn’t). Probably others I can’t recall at the moment. One of the first SF books I read as a child was a time travel story – Space Agent and the Ancient Peril, by Angus MacVicar. I recently bought a copy of the same edition (with the same cover) as the one I borrowed from the library all those years ago. There’s about a zillion Golden Age s-f ebooks and short stories here http://manybooks.net/authors.php Lots of different formats too. That Leiber tale is in The Best of Fritz Leiber anthology, along with the story every cat lover should read, Space-Time for Springers. I read The Silver Eggheads in the sixties (I thought the fifties, but it wasn’t published until 1961 – oh well). I promptly forgot the title, but the idea of the canned brains stuck in my mind, along with Zane Gort, the robot author. A couple of months ago, I stumbled across the book quite by accident, bought it – and was bored rigid! Thanks for that link – I’ve just downloaded Leiber’s The Moon is Green as a PDF to start me off. It’s good being able to read books without them taking up shelf space (I always resent the fact that the number of books you can keep depends on the size of your house, not the size of your brain). Glad you agree on the Silver Eggheads. I only managed to read it right through because I thought I should. I’ve bookmarked your machine books rant for later. So, how did 164 pages of random questions become a bestseller? Some people, it seems, will buy anything – very popular with pseudo-intellectuals, and bar-parlour philosophers, I’d imagine.